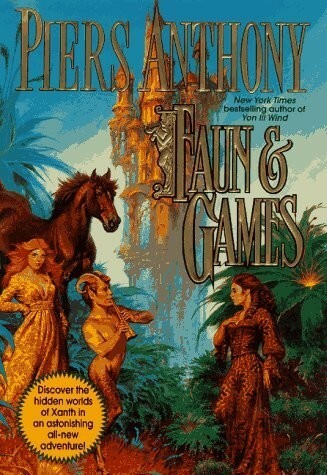 In his latest Xanth adventure, Faun & Games, Anthony reveals an amazing new facet of this fabulous realm never before suspected. Astonishing as it seems, orbiting the head of Princess Ida of Castle Roogna is a tiny miniature planet called Ptero, where everything in Xanth that ever was, or might be, can be found! For Forrest Faun, a young satyr searching for a suitable spirit to save a magical tree, Ptero may well be his only hope. When he offers to do a service for the Good Magician Humfrey in exchange for an Answer to his Question, that wise wizard refuses. Instead, he sends Forrest a remarkable companion to guide him to this remarkable world-within-a-world. Imbri is a "day more", an enchanted magical steed who can conjure extraordinary dreams and assume the form of an enchanting young woman. Together she and Forrest set off on an adventure-filled quest. But Ptero has some surprises for the travelers. Since the planet lacks sun and stars, its directions are marked instead by colors. Time behaves in a most unpredictable fashion, creatures are seldom what they seem, and no one ever does anything without receiving something in return. The land is broken by comic strips filled with punnish perils and infested with strange beings, including contrary Centaurs and ogling Ogres. And, in a diminutive castle on this microscopic world, Forrest and Imbri are at last given a Service by a minuscule Good Magician: to help two pert and flirty young princesses, Dawn and Eve, save their world from marginalization. But to achieve this goal, they must go deeper still into the hidden realms of Xanth - to the paradoxical planet of Pyramid, which is to Ptero as that world is to Xanth. There, at last, Forrest Faun will find his heart's desire and discover that the secrets he seeks have been far closer than he had ever imagined.